Home PV Sindhu PV Sindhu first woman to fly on Tejas. PV Sindhu first woman to fly on Tejas. PV Sindhu on Saturday co-piloted the indigenously built Light Combat aircraft Tejas at the Aero India show in Bangalore. The ace shuttler, according to her pilot Captain Siddharth, coped a force of 5G during her flight. I am very happy about being the first woman to fly the Tejas. This day is dedicated for women. Hence I will remember this day forever, she told reporters after the 40-minute routine. Tejas, built by the state-run Hindustan Aeronautics Limited (HAL) is a single-engine multirole light fighter. It is set to replace the aging Jaguar and Mig-21 fleet in the Indian Air Force. 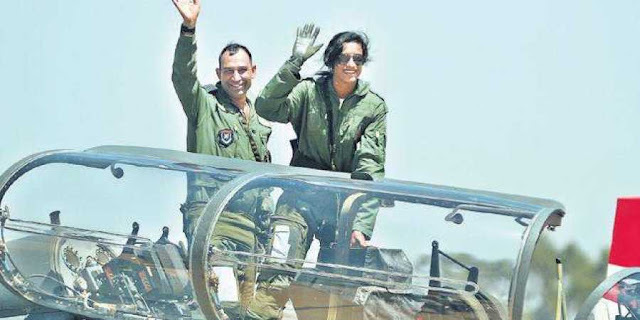 Sindhu said that the real hero was the aircraft and she was honoured to have got the opportunity to co-pilot. It was definitely a great experience and a great opportunity. I feel very honoured that captain Siddharth showed me all the stunts, she said. The show itself ended with a fire that gutted nearly 300 vehicles at the parking lot of the venue. Officials say the cause of the fire could be a lit cigarette that was disposed on the grass in the open field. Senior police officer MN Reddi said the fire spread rapidly due to dry grass and strong winds. Hundreds of vehicles, including two-wheelers and cars, were seen parked in files in the open ground, surrounded by fire. Sindhu shot to the nation’s psyche when she became the first Indian badminton player and the first Indian woman to win an Olympic silver at Rio 2016. Since then she has established herself as one of the best players in the world, winning medals in the Commonwealth Games and Asian Games in 2018. Sindhu was last seen in action at the Senior Nationals where she ended runner-up to Saina Nehwal in the women’s singles draw. In December 2018 she broke her finals jinx by beating Japanese world no. 5 Nozomi Okuhara and winning the BWF World Tour final. She was the first Indian to win the title and is now gearing up for the All England Badminton Championships that begins on March 6.